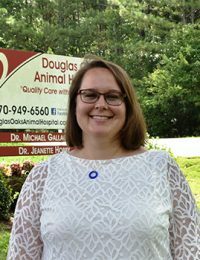 Dr. Jeanette Hobby has been an associate at Douglas Oaks Animal Hospital since June 2010. She did her undergraduate studies at Clemson University, getting a degree in animal veterinary sciences. From there she traveled to Mississippi to get her doctorate at Mississippi State College of Veterinary Medicine. Since settling in Douglasville, she has come to love the outdoor activities and fun local festivals that Georgia has to offer. Her dogs Mollie (the Mississippi Mutt) and Pancho (a pretty rotten yorkie-poo) especially love the trails at Clinton Farms while the cats, Matt and Maggie, prefer to watch the songbirds from the comfort of the couch. She enjoys working with pets in all life stages however is especially fond of getting puppies and kittens started off on the right “paw” addressing both medical and behavioral needs to make pets well rounded members of the family.